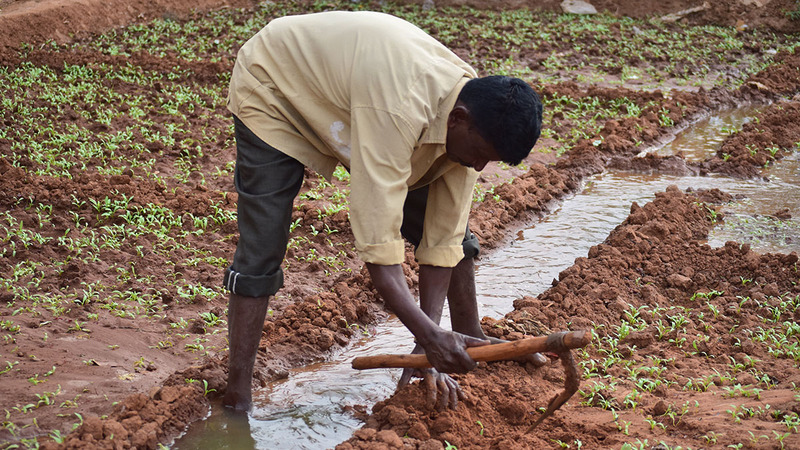 In Ramagondanahalli village, Muniraju Hanumanthappa bends over his clay-coloured soil surrounded by bright green spinach leaves. He quickly prunes the plants, dwarfed by the apartment complex next to his small plot. Ramagondanahalli is an urban village being swallowed by the city. It lies on Varthur Lake, one of the biggest in Bangalore, which is known as the Silicon Valley of India. There are copper-tinted dirt roads, small-scale vegetable farms and a man who calls people to temple by beating a drum. 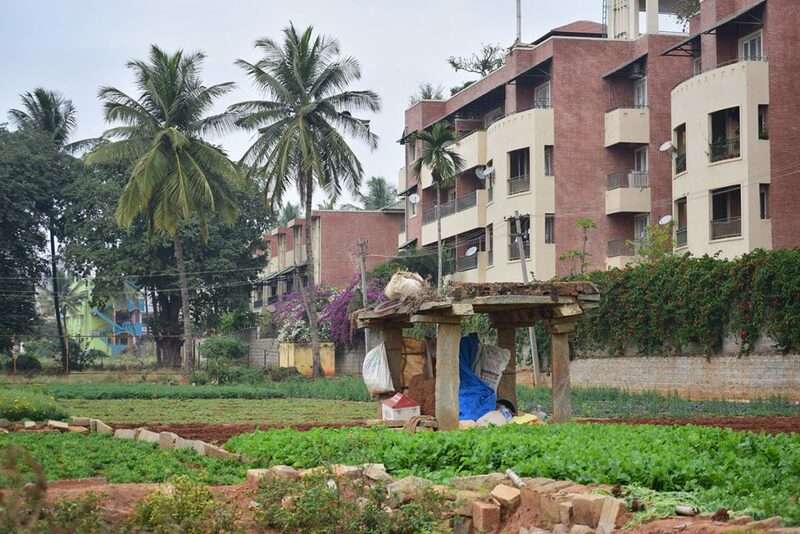 The once-rural farming community is now part of eastern Bangalore, near the city’s mighty IT campuses. 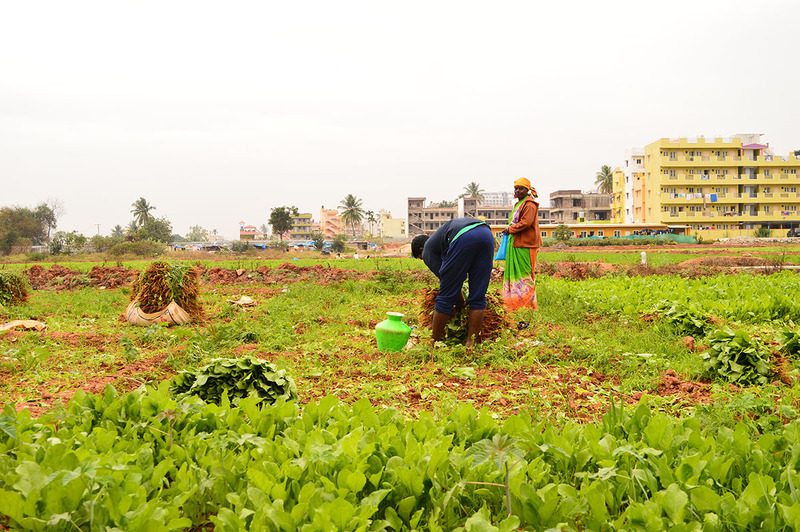 This rapid urbanisation has thrust urban farmers like Hanumanthappa, who is 45, into a fraught relationship with the city. They are confronted with a choice: continue farming under adverse conditions, or sell their land. Ramagondanahalli is emblematic of what’s happening throughout Bangalore. The city’s concrete-covered area has expanded by 925% since 1970, with more farmland being sold off to developers as the city embraces its tech boom. The new urban landscape is testing farmers’ resilience as they grapple with how to move forward. A stream from Varthur Lake irrigates Hanumanthappa’s soft russet plot. The second biggest lake in Bangalore lies just beyond his farm. 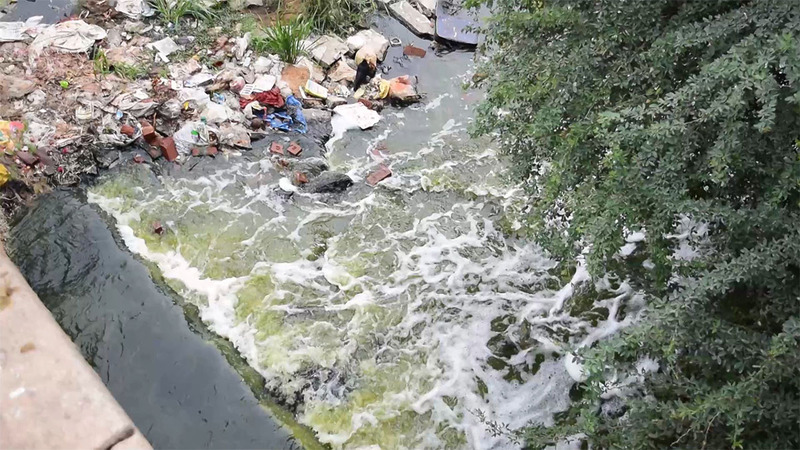 He has always used lake water, but now it is extremely polluted. Hanumanthappa knows he’s not supposed to use water straight from the lake. But without enough money to drill a borewell, he feels he has no other choice. 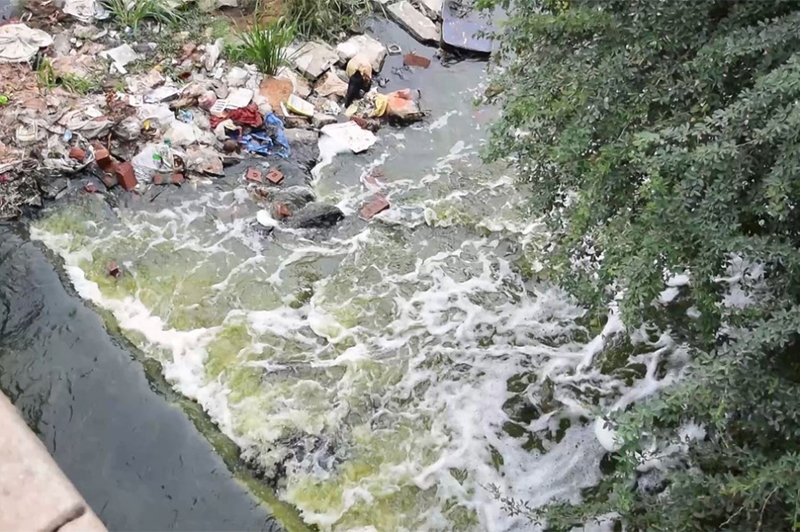 Varthur Lake is polluted with both industrial waste and untreated residential sewage from the apartments that line its perimeter. There is no hiding the pollution, since stinking foam froths at the lake’s surface, especially when it rains. Upstream, Bellandur Lake periodically catches fire because of the cocktail of chemical pollutants it contains. Now, Hanumanthappa can only cultivate crops with short growing cycles so they don’t rot in the field. Spinach is the only plant he’s found that can grow with lake water. He sells his produce to the nearby HAL (Hindustan Aeronautics Ltd) market. A vendor at the market, Shashikala, says she and her colleagues avoid produce from this part of Bangalore. “If [the water] comes directly from the lake, then there will be contamination,” she says. Farmers here admit they lie about how they grow their produce in order to sell it. Usually, Hanumanthappa stands beside farmers from a different village and demands the same price as they do. He doesn’t reveal to customers where his own produce comes from. “People may lose trust… [but] I have no other choice but to do that,” Hanumanthappa says. TV Ramachandra, a professor at the Indian Institute of Science and a leading authority on sustainability issues, warns that pollution in the city’s lakes can get into the food supply chain through farms like Hanumanthappa’s. 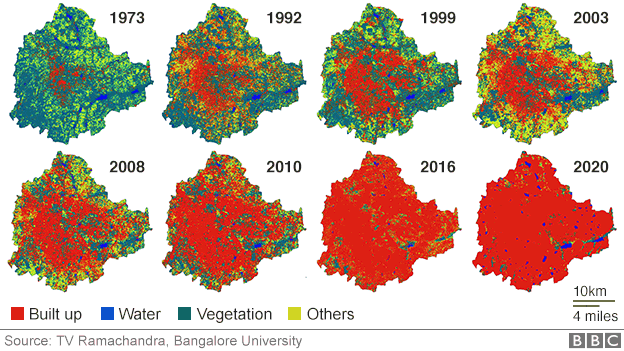 Prof Ramachandra’s data also suggests that Bangalore’s farmlands and green spaces are disappearing at an astonishing rate, with more high rises and commercial developments being put in their place. 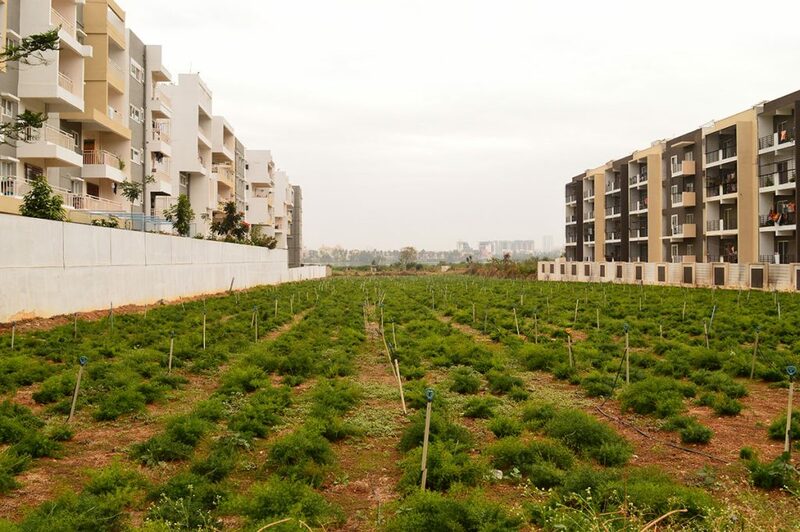 According to the state government’s Department of Agriculture, as Bangalore was witnessing its IT boom and burgeoning growth, the area covered by vegetable crops in the district decreased from 0.1 million hectares in 2000 to a mere 0.04 million hectares by 2015. 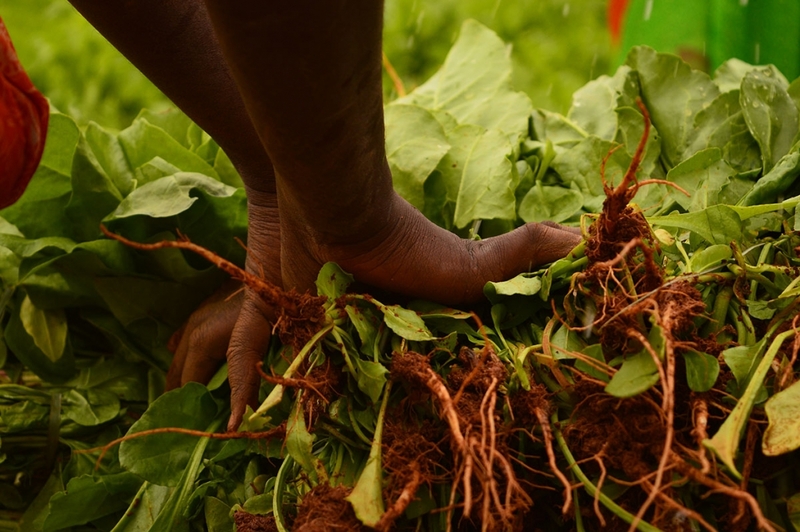 As a result, vegetable production went down 72%, from 0.29 million tonnes to 0.08 million tonnes during the same period. The city’s development doesn’t just affect farmers. It is being driven by vast numbers of people coming to the city, many to work in the vibrant IT sector. They all need access to reliable food sources. But some people in Bangalore’s affluent middle class have noticed their food sources aren’t trustworthy – and are doing something about it. 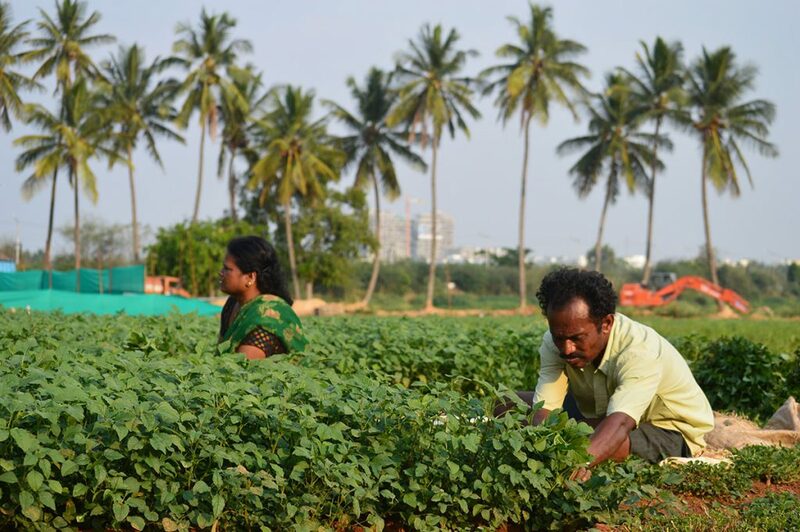 Meenakshi Arun, an IT professional at Hewlett Packard, has joined a growing middle class movement who grow their own food. She says her group, Garden City Farmers, has trained more than 5,000 people in the last five years. But individual citizens growing vegetables on terraces and patios requires time, money and space that most people can’t afford. For the traditional farmers in Ramagondanahalli, their only equity is in their land. When that land becomes less productive because of polluted water, they turn to selling. One villager who turned from rose farmer to real estate broker is embracing the development. Sanjeev Sanjeevappa grew up in Ramagondanahalli, but he doesn’t think a farming lifestyle is feasible any more in the city. 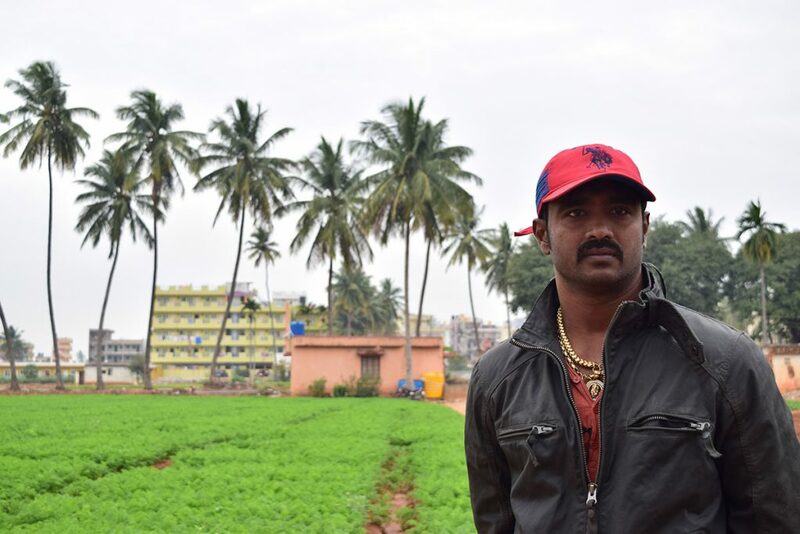 His community’s farms are surrounded by high-rises for Whitefield’s IT workers, and the market prices for crops are constantly in flux. Sanjeev is young, tall and wears solid gold necklaces and rings. He says he owns 10 acres of land outside the city, 20 times what Hanumanthappa farms on, and he bought it by selling a small portion of land in Ramagondanahalli. This struck him and he thought other farmers could do the same, so he started to broker land deals. Being a real-estate agent fetches him a lucrative commission. Typically, intermediaries like him take 2% of the selling price. 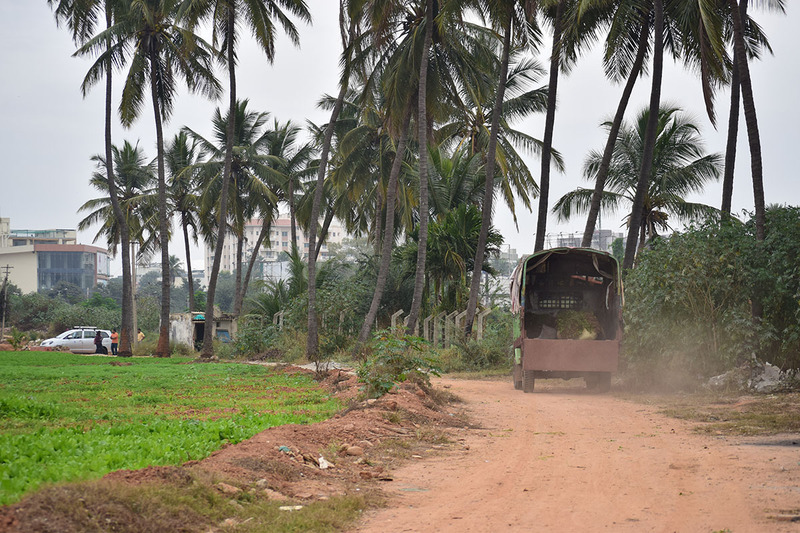 In 2012, an acre of land in Ramagondanahalli was selling at 40-60 million rupees ($618,000-$927,000; £495,000-£742,000). Today it costs double that and fetches between 80-100 million rupees ($1,235,000-$1,544,000; £989,000-£1,236,000). He believes the only way out of agricultural instability is to bundle farmers’ small plots together and sell their combined land as a package to developers. He is a farmer-turned-real-estate agent who connects farmers with builders. “For farmers who have one-tenth of an acre of land, it is very difficult to sell it to the builders directly. So, we pool farmers who own small portions of land and collectively make them agree to sell it to builders,” Sanjeev says. He brings together about 50 farmers at a time. Then, he will work with a developer to build houses and negotiate with buyers for a good price. Within each new layout or set of apartments, two units are typically reserved for the farmer whose land it’s built upon. That way, farmers can rent out one unit to use as a revenue stream. Or, the farmer can take their money and buy more land further away. Muniraju Venkataswamy worked with a broker like Sanjeev to sell his plot in Ramagondanahalli five years ago. His family had been farming his land for three generations. 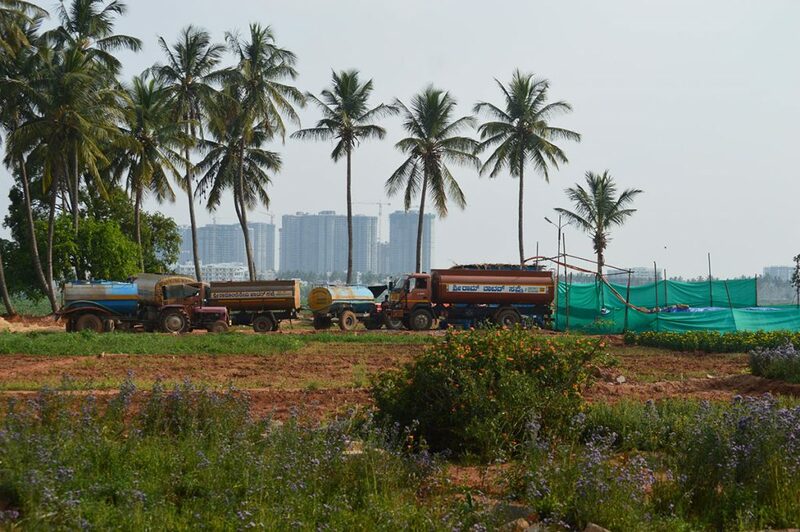 But the apartments being built in Ramagondanahalli draw more groundwater for utility purposes, which depleted the well around his farm. He now has to rely on polluted lake water. He’s continuing to farm until the developer breaks ground on his farm. Venkataswamy got 5 million rupees ($77,000; £63,000) for his one-tenth of an acre plot. With that money, he built a three-story apartment building in Ramagondanahalli. His family lives on the ground floor and he rents out the upper two storeys, which brings him 15,000 rupees per month ($230; £185). He also had money left over to purchase a bigger piece of land 30km (19 miles) away from the city to continue farming. “My future generation will need land for farming. If I stay here it won’t be enough. So we bought a bigger portion of land by selling here,” Venkataswamy says. Bangalore used to be known for its image as a lush garden city with a foot firmly in the 21st Century. The municipal corporation acknowledges it has failed to provide the infrastructure the booming city needs. “As a civic body, we could not match the speed at which the city was growing. We accept that we had failed to provide basic amenities,” says MB Thippanna, additional director of town planning. But he says the authorities have now woken up to take corrective action. But as the city continues to expand, the future for traditional farmers who are being squeezed out is still uncertain. Unlike Venkataswamy, Hanumanthappa is not selling. He’s dedicated to farming, and that’s important for the city because the urban poor need locally-sourced food. 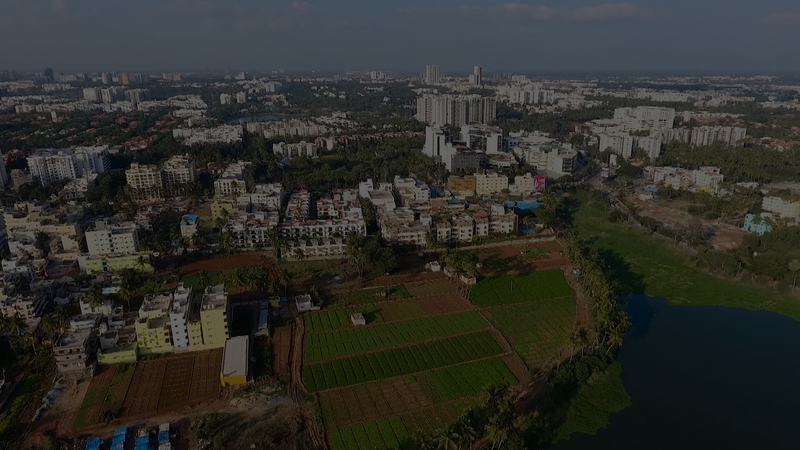 As local farmers who supply Bangalore with produce leave farming, the city will have to source its food from further away. Affluent residents can afford such higher priced foods at supermarkets, but KC Raghu, a nutritionist, says cheaper, locally-grown produce provided to markets and street vendors is what the urban poor rely on. Taking a break from his field work in Ramagondanahalli, Hanumanthappa goes to rest under the ramshackle stone shed at the edge of his farm and smoke a beedi (a traditional hand-rolled Indian cigarette). Recounting his ordeal, he says the half an acre of land that he’s farming on costs 40,000 rupees ($600; £490) a year to rent and fetches him a meagre 100,000 rupees ($1,500; £1,230) of income for the whole year. That money supports his entire family. Unlike some of his neighbours, he does not wish to move away. He knows no other job than farming. Helpless, he watches his neighbours who have quit farming extract groundwater from those plots, selling it to nearby apartments to make a living. Hanumanthappa could have earned three times what he does now by cultivating crops like carrot and cauliflower, had the lake been clean. But he sees no future in this as its polluted water has ruined his earning potential. “If the owner of this farmland chooses to sell the property and ask me to go, I have to leave,” Hanumanthappa says.